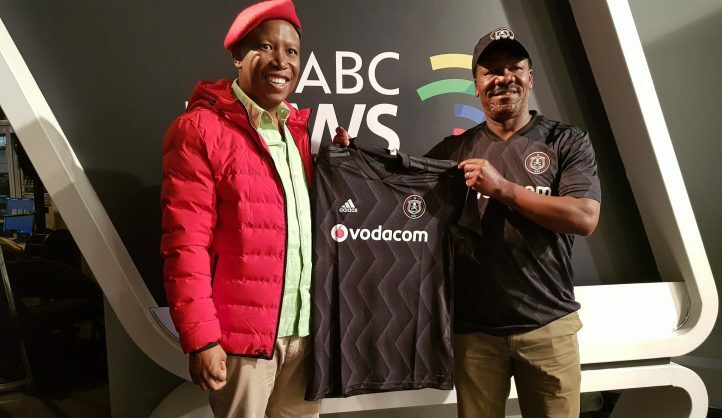 EFF leader Julius Malema was given an Orlando Pirates Jersey at SABC Morning Live. They were there for the launch of their new Jerseys. Pic: EFF Twitter. Malema said the public enterprises minister was ‘untouchable’, adding the minister rose to power in the ANC ‘through an Indian cabal’. The EFF commander-in-chief in an interview on SABC’s Morning Live sought to set the record straight on his recent comments calling Indian and coloured people racist. The comments, made at a Youth Day rally at Matlosana Stadium in Klerksdorp, North West, caused widespread controversy, with some accusing Julius Malema himself of racism for the utterances. Malema highlighted his record of challenging prominent people of all races as evidence of his assertion that he wasn’t racist. “I am not racist, I confront every wrongdoing. I came to SABC to challenge Hlaudi, why is it that I am not considered racist then? “White and Indian racism has been institutionalised, and I will call it out without fear of favour,” he continued. When it comes to setting his sights on those in power, Malema’s latest target appears to be Minister of Public Enterprises Pravin Gordhan. On July 5, The Citizen reported that at a press conference, the EFF leader lashed out at what he referred to as “a dangerous regrouping of the neoliberal market-driven agenda, mainly led by Pravin Gordhan”. During his interview, the firebrand leader continued to question the minister’s leadership. “Pravin has become untouchable, and that should not be so. He should be treated as other ministers are treated. We are challenging the president to dismantle that power. “During the UDF times, [Pravin] isolated those he didn’t agree with. When the ANC didn’t recognise him for the negotiations, he came through an Indian cabal,” Malema continued.